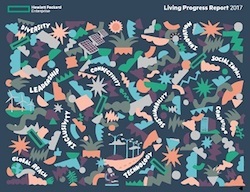 HPE’s new Living Progress Report demonstrates how we’re applying the innovation engine of HPE to corporate citizenship and sustainability. At HPE, Living Progress is our plan to create sustainable solutions for our company, our customers, and our world. It’s the way we integrate sustainability into our business strategy, building on a commitment articulated by our founders 60 years ago. Sustainability and ESG issues are rising to the top of Board room agendas as investors, customers, and regulators increasingly take note. For the sixth consecutive year, HPE’s commitment to sustainability has earned distinction on the Dow Jones Sustainability Index, which recognizes the world’s most sustainable companies. HPE received the highest industry score on six indicators including our climate strategy and commitment to human rights, as well as economic dimensions including policy influence and privacy protection. To address the exponential increase in demand for computing power, HPE is delivering a new breed of innovation that is purpose-built to maximize efficiency without sacrificing performance and scale. Last year, HPE accounted for more supercomputers in the Green500 list than any other company and secured the #1 ranking for the most energy efficient supercomputer in the world. The introduction of new consumption models and pay-as-you-go services are also achieving reductions in energy use, hardware materials, and end-of-life costs for our customers. Beyond efficiency, HPE is delivering world leading security and reliability. For example, HPE-developed “silicon root of trust” technology in our Gen10 servers makes them the most secure industry-standard servers on the market. This year, HPE was acknowledged with 100% ratings by the Human Rights Equality Index and the U.S. Business Leadership Network Disability Index. We recognize the importance of fostering an inclusive environment and hold our people leaders accountable for the actions they take to support diversity and inclusion within their own teams. To create a long-term commercial incentive for suppliers, we commit that by 2025 80% of HPE’s manufacturing spend will go to suppliers with science-based targets in place. HPE’s capability-building program will provide suppliers with training on low-carbon strategies, eliminate barriers to participation, and drive greater accountability. It’s our goal that this new standard for supplier engagement will create a ripple effect that drives action throughout our company, customers, and the world.